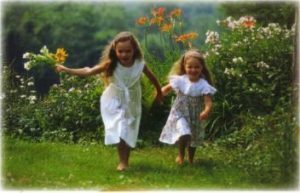 For most people – the, family home is the most important asset. But without the right protection – it can also be our biggest headache. As a builder or home owner – protecting, maintaining and caring for your investment, is essential. Every stage requires decisions that will have direct results on your building’s value and life span. One of the most confusing of these decisions – is the selection of a termite management system that suits your requirements. The starting point for this decision – is the choice of either a chemical or physical barrier. Every system offers advantages (and disadvantages) and based on your individual requirements and building styles some may suit you better than others. are the length of protection and the cost or ease of re-treating. Physical barriers – offer a more `set and forget’ approach. No liquid chemicals are applied. What you see is what you get. Kordon provides the best from both worlds. Kordon is a building product, which could be compared to treated timber in so far as it is termite proof and termite repellent. Kordon’s repellency creates an unpleasant environment for foraging ter-mites, who once confronted with Kordon will go forage elsewhere. This is a huge advantage over common physical barriers where termites will investigate the complete barrier until they find a gap or a weakness. As Kordon, like treated timber, contains a repellent within the product it is a “life of the building product” and requires no re-treating. guaranteed every time it isinstalled. The purpose of a pre-construction physical termite barrier is to prevent the concealed entry of termites in to a building. Termites could trail up the outside wall around the barrier but they would leave a visual mud lead if they did. The current Australian Standard 3660 states that regular, com-petent inspections should be carried out, at least on an annual basis. Annual inspections become an integral part of your termite management system and provide) cost effective long term insurance to your most! important asset. KORDON offers a host of advantages. As KORDON is safely encapsulated between the two plastic sheets KORDON is the ideal choice for allergen free housing or environmentally sensitive sites. It is for this very reason KORDON has been chosen for a large number of schools, hospitals and public buildings over the last 5 years. KORDON – proudly developed and manufactured by Bayer in Australia. The Bayer acquisiton of Aventis CropScience in 2002 has resulted in a new and vital division called Bayer Environmental Science. We are the world’s largest environmental science business group and the most innovative creator of responsible pest and disease management solutions. Our global network of resources is further complemented by our in-depth knowledge and experience in the Australian market. Our goal is to increase our lead as the most innovative creator of responsible pest control solutions. We are continually developing new low-dose technology and integrated pest management techniques to replace older, less desirable methods. Our resources and capabilities enable us to set higher standards for the industry as a whole. By pooling our knowledge and resources with the experience and under-standing of the people we serve, we will achieve new practices that are environmentally sustainable as well as cost effective. This approach benefits everyone – including the wider community and the environment we share. Bayer Environmental Science provides for Australian innovations with global backing. Kordon is a unique Australian developed product that has been extensively tested for 14 years by Bayer, the CSIRO, State Forestry Departments, State Building Authorities and Building Design academics. Kordon Termite Barrier has no affect on the structural design of the building. Kordon has been tested and approved for use in “Allergen Free” construction. Kordon Termite Barrier has been tested and approved to perform as a physical barrier for 50+ years (the commercial life of a building). In all evaluation work carried out by Bayer, Kordon has achieved 100% performance as a physical barrier. Termites do not attempt to penetrate Kordon Termite Barrier. Bayer CropScience provides a 10 year / $100,000 structural timber replacement warranty against termite penetration of the Kordon barrier. 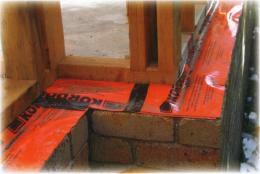 The Kordon Termite Barrier can only be installed by currently accredited Kordon installer’s. Bayer CropScience and the accredited installer provide a complete set of documentation to the building owner upon completion of the building project. and the manufacturers specifications, the Installation Report detailing where Kordon has been installed and the annual inspection Meter Box Sticker to record regular inspection details. The Kordon Termite Management system is a physical barrier designed to prevent concealed termite access to new buildings. The Kordon Termite Management system incorporates an approved termiticide and offers long term protection to new buildings. Kordon also acts as the moisture vapour membrane when installed as the termite and moisture membrane barrier in a complete under slab system. Installers, home owners and the environment are also protected by this termite management system. Kordon is approved for use in council areas where the use of soil termiticide treatments have been prohibited. Termite ingress to buildings where Kordon has been installed will be deterred by the repellency of Kordon. This feature is unique to Kordon and has resulted in the products leading market position and 100% performance* for 14 years. Kordon is manufactured to strict quality guidelines. It is not possible to under treat using Kordon. Accredited installers Kordon is installed by accredited installers who have been trained by Bayer to install Kordon to the manufacturers specifications. Kordon is a robust product. It takes a sharp knife to cut Kordon. A blunt object has little chance of penetrating the product. Accidental holes are easily repaired by patching. Kordon can be installed in many difficult and complex situations such as multiple penetrations or step downs. It can be moulded around unusual shapes and can be quickly cut and joined. All pipes and penetrations are individually protected by Kordon as part of this treatment. The concrete is then poured on top of Kordon TMB. When installed as a complete under slab barrier, Kordon TMB is the most comprehensive termite treatment system available. The physical presence of Kordon TMB over the site provides repellency to termites for the entire area. Because of this repellency, Kordon TMB is an excellent choice for areas of high termite risk. AS 2870 Kordon TMB must be overlapped by 200 mm to comply with moisture membrane requirements and taped with quality duct tape. This holds the Kordon in place until the concrete is poured. Kordon TMB is repellent to termites and the overlapped joints have 2 layers of the repellent Kordon which provides extra protection. Extensive studies have proven that the termites do not penetrate through these areas *. Kordon Termite Barrier (TB) is a flexible termite protection system which can be used as part of a complete termite barrier. The Kordon TB warranty covers termites coming through where the product has been installed. 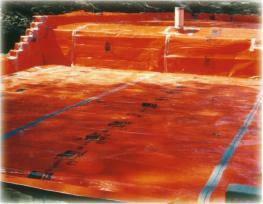 Kordon TB is used in conjunction with the concrete slab to form a complete termite barrier system. Kordon Termite Barrier offers protection against termites, through the areas of the building where there is the greatest risk of concealed termite access (le: wall cavities and pipe penetrations). Kordon Termite Barrier is only part of a termite management system for a new building. To comply with the building regulations, the slab must be poured to the concrete standard AS 2870. The slab then becomes part of the termite barrier and the Kordon Termite Barrier protects the high risk areas from concealed termite ingress. The decision on which Kordon System to use should be determined through consultation with the accredited installer, the home owner, builder, building designer, architect and engineer.